GBPUSD is weakened due to the USD empowerment and the possibility of Fed’s rate hike. The support rests at 1.39100 with resistance at 1.40030 which the weekly pivot point at 1.39910 is located in between the lines. The EMA of 10 is moving with bearish bias in the descendant channel and it is above the EMA of 200 and below the EMA of 100. The RSI is falling towards the oversold area, the Stochastic is showing downward momentum and MACD line is below the signal line in the negative territory. The ADX is showing sell signal. 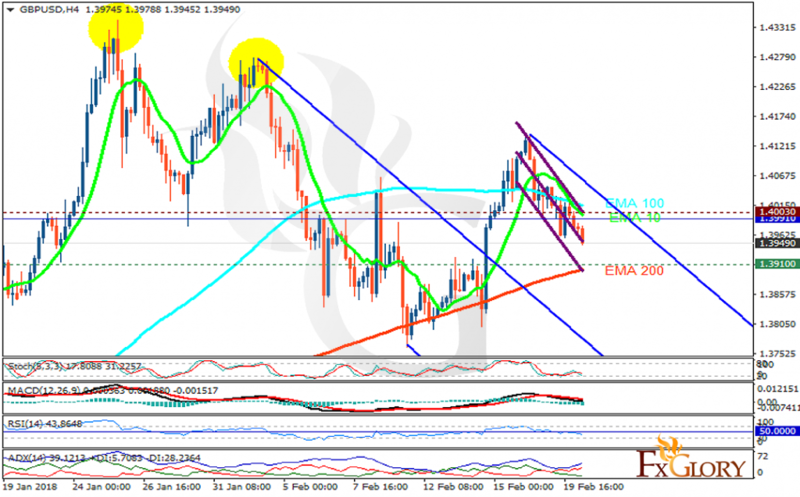 All indicators are showing a downward trend therefore sellers can target 1.38. However, if the resistance line is broken, buyers can return to the market and target 1.41.